Even nerds should work out. I don’t care what shape you’re in, staying active is important. I have a chronic spinal injury and for years I was full of excuses and didn’t join a gym. But this year I finally was peer pressured into joining Planet Fitness by my awesome colleagues who encouraged me to come with them after work. Before joining a gym I had gone to physical therapy for my back, so I know which machines to avoid to stay safe. My routine currently is about a half hour of cardio and a half hour on the weight machines… plus 5-10 mins on the elliptical. I’m still not in perfect shape but I’m making small improvements, and I feel a lot better about myself for at least making the effort. 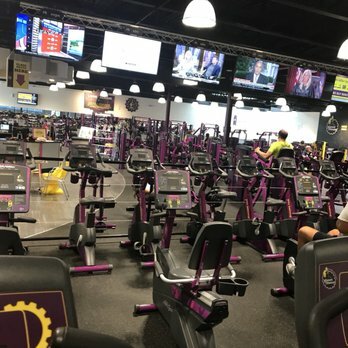 Planet Fitness is a great starter gym for people like me who are a little intimidated to get going. The best part is the price – $10 a month if you are dedicated to one location, and $22 a month for Black Card, which allows you to go to any location and take advantage of some other perks like the hydro massage therapy beds (this alone is worth the Black Card membership fee imho). I went with Black Card because I love going to different locations, free massages and half price drinks. Of course, not all locations are the same. Depending on which gym is your ‘home’ location, you’ll find different membership fees and other fine print. Luckily I found a gym near my house on LI to set as my home, to avoid the $10 sign up fees at the NYC locations. Gotta shop around and be smart! It’s important to tour a gym before committing. My favorite PF location is in Great Neck, NY. It’s located under a shopping center and has a ton of square footage. The weight room just keeps going and going. There are always enough treadmills and elliptical machines. They also have the most hydro massage beds and massage chairs that I’ve seen in any gym location. My only complaint about Great Neck is that the cardio machines don’t have little TV’s installed in them like the machines in NYC have. You are stuck watching the pre-selected news channels and whatnot that are showing on the many TV’s posted around. But there is free Wi-Fi so I could just put on Netflix on my phone and watch whatever I want. Another location on LI that I’ve frequented is Carle Place, NY. This location is convenient because it’s near my house, but that’s really the best thing I have to say about it. I think this gym is a little awkward because the cardio machines and the weight machines are facing each other. You can stare at other people working out! Oh boy! It’s not THAT big of a deal, but I just wonder why they chose to set it up that way. Regardless, it’s clean and not very busy, so I still go there. I can watch the big guys work out on the heavy weights while I run. Not such a down side, I guess lol! In NYC, I’ve been to Tribeca and Herald Square. They are very different! Tribeca has a nice giant square shaped space where the machines are set up similar to Carle Place, except the machines DON’T face each other. And the machines all have mini TV’s in them, which is fun. You can watch whatever you want, turn on CC and listen to music… whatever works for you. Herald Square on the other hand, is set up among three floors. It’s very confusing and disjointed. There are elliptical machines in a space that looks like a hallway. Some of the treadmills were broken the last time I went there. But the Herald Square location is right next to Penn Station, so it’s great if I’m in a rush. That is, if I can find an open locker! It’s definitely the busiest gym I’ve been to out of the four. Machines with TV’s in them! Even despite the down sides of some of these locations, I really love Planet Fitness no matter which location I go to. It is definitely a ‘judgment free zone’ and you see people of all fitness levels and age groups working out. The staff is usually a bunch of young people so naturally they would rather socialize than do work. I get it, I was that age once, lol! But they are still friendly if you approach them and ask them for help. Overall, my biggest con for PF is that they don’t offer organized classes in the traditional sense. They have little meetup sessions that you can sign up for and get some guided exercises with a staff member, but it’s not really the same as a Zumba class. But that’s okay – I’m more of a lone wolf anyway! I like to use an app called C25K to get back into running shape. It uses interval training to get your body used to running long distances. It’s just enough guidance that I need to stay motivated. But what really motivates me is the hydro massage bed. It’s my favorite thing. You can lay on it for 10 mins at a time and you can customize the massage to be exactly what you want. Laying on the hydro massage bed after working out feels so amazing. It makes my sciatica go away for the rest of the day. It’s the best thing!! If you are scared of committing to a gym, give Planet Fitness a try. It’s cheap and not all locations require an annual contract. (Again, shop around!!) Or if you recommend a different gym, I’m all ears! What gym do you think is the best? ?